Python defines only one type of a particular data class (there is only one integer type, one floating-point type, etc.). This can be convenient in applications that don’t need to be concerned with all the ways data can be represented in a computer. For scientific computing, however, more control is often needed. In NumPy, there are 24 new fundamental Python types to describe different types of scalars. These type descriptors are mostly based on the types available in the C language that CPython is written in, with several additional types compatible with Python’s types. Array scalars have the same attributes and methods as ndarrays. This allows one to treat items of an array partly on the same footing as arrays, smoothing out rough edges that result when mixing scalar and array operations. Array scalars live in a hierarchy (see the Figure below) of data types. They can be detected using the hierarchy: For example, isinstance(val, np.generic) will return True if val is an array scalar object. Alternatively, what kind of array scalar is present can be determined using other members of the data type hierarchy. Thus, for example isinstance(val, np.complexfloating) will return True if val is a complex valued type, while isinstance(val, np.flexible) will return true if val is one of the flexible itemsize array types (string, unicode, void). 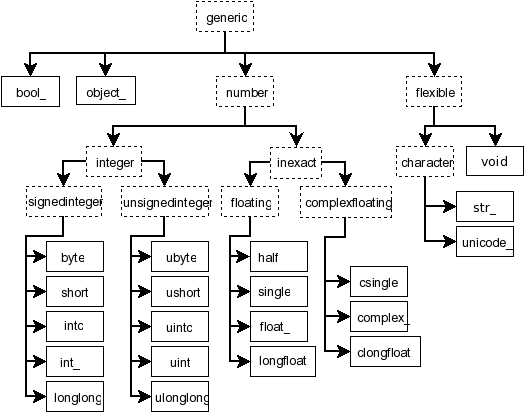 Figure: Hierarchy of type objects representing the array data types. Not shown are the two integer types intp and uintp which just point to the integer type that holds a pointer for the platform. All the number types can be obtained using bit-width names as well. However, array scalars are immutable, so none of the array scalar attributes are settable. The built-in scalar types are shown below. Along with their (mostly) C-derived names, the integer, float, and complex data-types are also available using a bit-width convention so that an array of the right size can always be ensured (e.g. int8, float64, complex128). Two aliases (intp and uintp) pointing to the integer type that is sufficiently large to hold a C pointer are also provided. The C-like names are associated with character codes, which are shown in the table. Use of the character codes, however, is discouraged. The bool_ data type is very similar to the Python BooleanType but does not inherit from it because Python’s BooleanType does not allow itself to be inherited from, and on the C-level the size of the actual bool data is not the same as a Python Boolean scalar. The bool_ type is not a subclass of the int_ type (the bool_ is not even a number type). This is different than Python’s default implementation of bool as a sub-class of int. The int_ type does not inherit from the int built-in under Python 3, because type int is no longer a fixed-width integer type. The default data type in NumPy is float_. In the tables below, platform? means that the type may not be available on all platforms. Compatibility with different C or Python types is indicated: two types are compatible if their data is of the same size and interpreted in the same way. complex192 two 96-bit floats, platform? complex256 two 128-bit floats, platform? The data actually stored in object arrays (i.e., arrays having dtype object_) are references to Python objects, not the objects themselves. Hence, object arrays behave more like usual Python lists, in the sense that their contents need not be of the same Python type. The object type is also special because an array containing object_ items does not return an object_ object on item access, but instead returns the actual object that the array item refers to. Numeric Compatibility: If you used old typecode characters in your Numeric code (which was never recommended), you will need to change some of them to the new characters. In particular, the needed changes are c -> S1, b -> B, 1 -> b, s -> h, w -> H, and u -> I. These changes make the type character convention more consistent with other Python modules such as the struct module. Array scalars have exactly the same methods as arrays. The default behavior of these methods is to internally convert the scalar to an equivalent 0-dimensional array and to call the corresponding array method. In addition, math operations on array scalars are defined so that the same hardware flags are set and used to interpret the results as for ufunc, so that the error state used for ufuncs also carries over to the math on array scalars. generic Base class for numpy scalar types. There are two ways to effectively define a new array scalar type (apart from composing structured types dtypes from the built-in scalar types): One way is to simply subclass the ndarray and overwrite the methods of interest. This will work to a degree, but internally certain behaviors are fixed by the data type of the array. To fully customize the data type of an array you need to define a new data-type, and register it with NumPy. Such new types can only be defined in C, using the NumPy C-API.